We are nearing the end of Opera Omaha Week, which is part of National Opera Week. The overall goal of National Opera Week is advocacy for the art form. The week is full of events promoted and arranged by opera companies across the United States. The events are free or very low cost and open to the public. Again, the goal is to engage people who may not otherwise attend an operatic event and give opera a wider public exposure. Our week of events included a pre-broadcast talk by famed stage director, James de Blasis, at the Film Streams Met HD showing of Othello, a luncheon with Metropolitan Opera star, Peter Volpe, a Halloween party featuring Mr. Volpe and the Opera Omaha Artists in Residence, and, finally, on Saturday, a vocal master class led by Mr. Volpe. All of these events were free and open to the Omaha community and beyond. THIS is the meaning of National Opera Week! The vocal master class this Saturday, November 3 begins at 1:00pm. Everyone is welcome to attend. Although the name “vocal master class” may sound very formal, the event is relaxed. You are not asked to sing or to participate. Attendees will hear Peter Volpe and our Artists in Residence (Maria Lindsay, Andrew Spady, and Kirk Vaughn Robinson) perform and Mr. Volpe will offer suggestions and information to the Artists in Residence. The audience is welcome to ask questions and you do not have to stay for the entire class. We want you to join us at our office, 1850 Farnam Street, for entertainment and refreshments this Saturday as we end Opera Omaha Week. Help us celebrate National Opera Week with four magnificent singers in a relaxed, fun atmosphere. RSVP to our Production Coordinator and fabulous Opera Omaha Week organizer, Cammy Watkins, at cwatkins@operaomaha.org. We can’t wait to see you here! Mr. Volpe’s biography below and the photograph above are from his website. In 2011 and beyond, performances include Angelotti in Tosca, Idraote in Rossini’s Armida and Doctor Grenvil in La Traviata at the Metropolitan Opera, Deguiche in DiChiera’s Cyrano at the Florida Grand Opera, Timur in Turandot at Florentine Opera of Milwaukee, Frere Laurent in Romeo et Juliette at Vancouver Opera, Raimondo in Lucia di Lammermoor at Austin Lyric Opera, and Ramfis in Aida at Arizona Opera. Most recent operatic engagements from the past two seasons (2008-2010) include Idraote in Armida at the Metropolitan Opera, Marcel in Meyerbeer’s Les Huguenots at the Bard Festival, Gremin in Eugene Onegin at Vancouver Opera and Opera Lyra Ottawa, Timur in Turandot at Opera Lyra Ottawa, Silva in Ernani and Mephistopheles in Faust covers at Lyric Opera of Chicago, Commendatore in Don Giovanni at Palm Beach Opera, Zuniga in Carmen at Arizona Opera, and Sparafucile in Rigoletto with Austin Lyric Opera, Arizona Opera and Portland Opera. 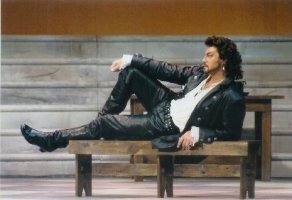 In the 2007-2008 season, Mr. Volpe created the role of Deguiche in world premiere of Cyrano with the Michigan Opera Theatre and Opera Company of Philadelphia, as well as performing Frere Laurent in Romeo et Juliettewith the Baltimore Opera, and Jacqueau in War and Peaceand Frere Laurent cover in Romeo et Juliette at the MET. Operatic engagements from 2006-2007 season include Banquo in Macbeth with Arizona Opera, the title role in Don Giovanni with Florentine Opera of Milwaukee, Frere Laurent in Romeo et Juliette with Atlanta Opera and Michigan Opera Theatre, and Zuniga in Carmen with the Seiji Ozawa Opera Project in Japan. Mr. Volpe made his notable Metropolitan Opera debut in their new production of Prokofiev’s War and Peace, and has subsequently returned for new productions of Berlioz’ Les Troyen, Strauss’ Salome, Mussorgsky’s Boris Godunov, as well as Falstaff, Gianni Schicchi, Carmen, Aida, I Vespri Siciliani, Cyrano di Bergerac, and Andrea Chenier, among others. In addition, he has appeared with San Francisco Opera in productions of Salome, Nabucco, and Romeo et Juliette, with the Lyric Opera of Chicago in Falstaff, with Washington National Opera for Britten’s Billy Budd and Tchaikovsky’s Maid of Orleans, as well as Mephistopheles in Faust and Ramfis in Aida with Palm Beach Opera, Mephistopheles in Faust with Vancouver Opera, and a debut with Portland Opera as Banquo in Macbeth. As a concert soloist, he has performed Verdi’s Requiem with the Philharmonia Orchestra of London at the Chichester Festival, the Manhattan Philharmonic at Carnegie Hall, L’Orchestra d’Imola in Italy, Oberlin Conservatory, Arizona State University, the Indianapolis Symphony, the Queens Symphony, and the Augusta Choral Society. He has also performed Beethoven’s Missa Solemnis with the New York Metropolitan Orchestra, Edmonton Symphony and Augusta Choral Society, Handel’s Messiah with Edmonton and Louisville Symphonies, and Mozart’s Requiem with the Choral Society of Philadelphia.